An industry leader of ethical mental health. GoodTherapy was founded by a therapist with the heart-centered mission of connecting people with qualified mental health professionals, reducing harm in therapy, and supporting therapists committed to ethical therapy practices. Read our Mission and Vision and learn why GoodTherapy.org was founded. GoodTherapy maintains the highest membership requirements, individually verifying each applicant meets strict educational, licensure, and philosophical guidelines. All members certify they are licensed to practice in their jurisdiction, and that their approach to helping people accords to the Elements of Good Therapy statement. While this certification cannot guarantee that every therapist listed in GoodTherapy works in a healthy and collaborative way, it comes closer to the ideal than any other directory. GoodTherapy Members get more than just referrals. Our Premium or Pro Membership includes unlimited access to online continuing education events, marketing tools and resources, publication and media opportunities, special discounts on therapy-related products and services, and more. GoodTherapy goes above and beyond other directories to include benefits of membership that support therapists in growing their practices and providing quality treatment to the people they work with. By listing your therapy practice on GoodTherapy, your profile can be found within our far-reaching partner and advertising network, including hundreds of mental health websites, directories, and social media sites. GoodTherapy receives over 1.5 million visits each month and ranks well in search engine results for industry keywords and location-based searches. Listing in our directory is a simple way to get you and your practice found by people searching for services online. 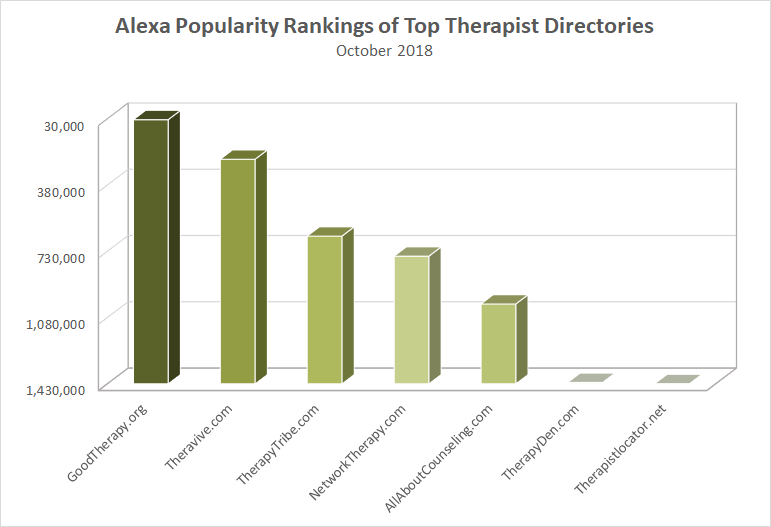 The Alexa Traffic Rank tracks website popularity across the web and is maintained by Alexa, a leading Internet analytics company not affiliated with GoodTherapy.org. Alexa Rank is the traffic and popularity rank of a website, compared to all other sites on the Internet. The lower the Alexa Rank score is numerically, the higher the popularity of the website.